Ni-base single crystal superalloy turbine blades containing defect grains were investigated by high resolution electron microscopy. 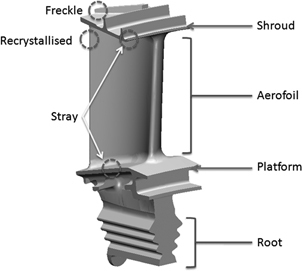 Several different types of defects, such as, stray grains, equiax grains and freckle chains which formed during casting, and recrystallized grains which formed during subsequent heat treatment, were selected. Regardless of the region of the turbine blade, many particles with large amounts of rhenium were detected at the boundary of the stray grain and matrix. The Re-rich particles were also detected at the boundary of the matrix and other defect grains, such as, equiax grains and freckle chain grains, and even at a low angle grain boundary. However, the boundary of the recrystallised grain and matrix which was formed after solution heat treatment showed just one Re-rich particle. Also, the composition of these Re-rich particles is different from any topologically close packed phases which have been reported in Ni-base superalloys. The results suggest that during solidification, the particles are formed from the melt and pushed ahead of each solidification front of the defect grain and the matrix, and piled up at the boundary of the matrix/defect grain.